Hello guys and gals and welcome to the Dorado Flu capitol of Sonora, we have this crazy bug going around here...its very easy to catch...We see the people getting this nasty bug...its so hard to cure...I am told the only way to cure, is you have to fish until the symptoms go away...So in short we all are doing our best to beat this nasty bug...Had one husband tell his wife he will be back in a day or two and was gone for 10days...I wouldn´t want to be the husband on the end of that one...I think I would take the bug...Anyway back to fishing. 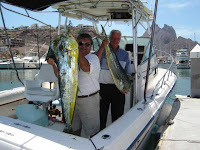 We have had the week you dream about...If you have ever been in a wide open Dorado bite...fish everywhere when you find them...small, medium and large Dorado...We have had boats out all week and doing very well with limits of Dorado...As you know the current limit here is two fish per person with a two day max...say if you where anchored up and did a over and back max would be 4 each...Anyway lots peanuts and some bigger bulls amongst the babies...We have probably in the last week caught and released 10-20 fish a day. Had a client from Karen from Long Realty with us and a man after my own heart...he baited, hooked and released all the fish for everyone...his comment after a half day of fishing, was we just kept enough for a good dinner...thank you.... Will not go into details of the everyday fishing trips because it would be just repeating. Bill fish bite is off right now...I personally think they are full and with so many peanuts to chose from who would want plastic...We see we tease and they just swim thru...had a couple blind strikes...but none stuck...Well enough of fishing, we have no flu, no shootings yet, great prices on rooms...Best Western is running a special with us....Call us for our three day two night special with a full day of fishing...From $195 per person..Min 4...thanks for taking the time to read this...Jon and Jen and the animal family..FYI .Above link is a customer comment of this last weeks fishing.